Implant-supported dentures can restore mouth function and help you regain confidence in your smile. Unlike traditional dentures, implant dentures will attach securely to titanium posts placed in the jawbone, and enable you to eat, talk, laugh, and smile without worry that your dentures will slip. Removable dentures require an adhesive to help them remain in place in the mouth. They rest on top of the gums, which can irritate them and cause soreness or other issues. Implant-supported dentures, attached to permanent posts, require no adhesive and will not irritate the gums. If you have been considering switching from traditional dentures to implant-supported dentures, give us a call at (559) 297-1294 to set up an appointment at our Fresno, CA office today. Titanium posts precisely placed in the jawbone support the visible, dental prosthetic that serves as a full arch of teeth in a patient’s upper or lower jaw, or both. Because the teeth attach securely to the implants in the jawbone, the dentures will not become loose. Stability is one of the main benefits of implant-supported dentures, enabling patients to eat foods without worrying their dentures will slip out of place. Dental implants also help the jawbone, as they mimic the function of teeth and their roots. The titanium posts keep the jawbone from losing mass, which occurs immediately following tooth loss. Pressure from chewing is distributed evenly across all implants, which provides comfort and capability for a patient. What is the Process for Receiving Implant Dentures? After an initial consultation, your dentist will begin planning your treatment case. Initial planning involves taking scans and x-rays of the soft and hard tissues in your mouth to determine the best placement for the implants. Placing the implants in the densest part of the jawbone at the correct angle will help ensure optimal results. 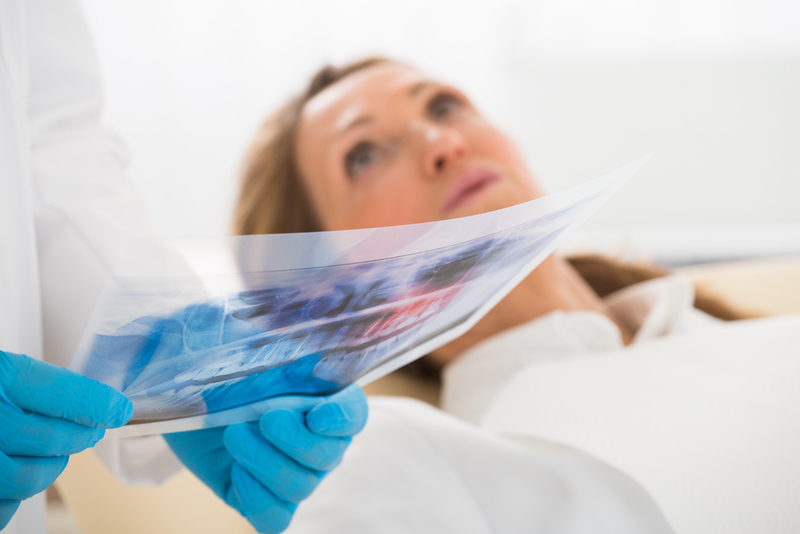 From the scans and x-rays, your dentist will create a surgical guide for using during implant surgery. During your procedure, the dentist places the implants in the jawbone. The gums above the implant site are stitched closed, and the implants undergo a process of osseointegration with the jawbone before the final dentures are placed. In most cases, implants and the abutments are placed in the same appointment. At the second appointment following implant surgery, the permanent arch of teeth is attached to the implant abutments. At this appointment, your dentist will show you how to care for your new implant-supported dentures. Am I A Suitable Candidate for Implant Dentures? The ideal candidate to receive implants would have healthy gums, dense enough bone to support the implants, and an understanding of the commitment it takes to maintain his or her implants. If gum health needs improvement before receiving implants, you and your dentist will work this into the timeline for your case. Similarly, if the jawbone requires bone grafting to become strong enough to receive and support implants, this will become part of your treatment plan. Dental implants require patience during the healing process and proper aftercare for overall mouth health. In addition to the time commitment, financially understand the cost-benefit of implants, though they are expensive upfront, is important to the process. At Fresno Dental Studio, Dr. Denes and our team are ready to help you replace those missing teeth and take control of your oral health and mouth function. Call (559) 297-1294 to schedule a consultation and determine your candidacy for implant dentures at our Fresno, CA dental .